Caring for tree-form shrubs is as easy as caring for the normal kind, though pruning needs are different. 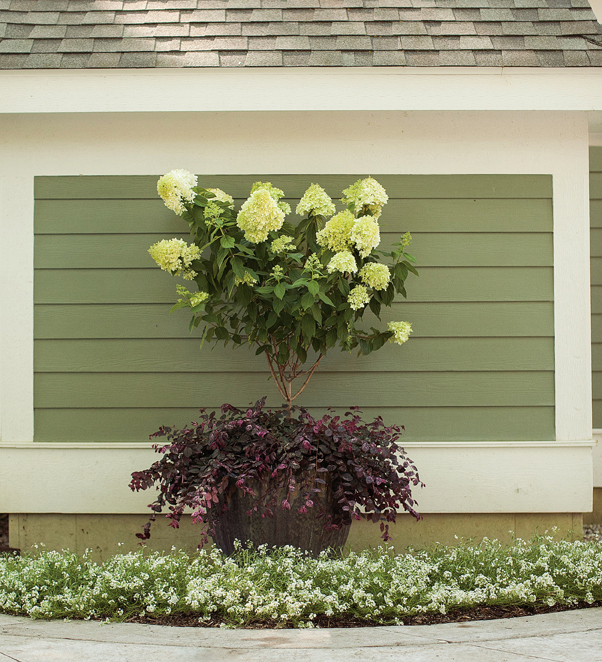 How do you make a fabulous flowering shrub even better? Make it a tree-form! Tree-form shrubs, also known as standards, are specially trained to grow with a single “trunk” and a leafy “canopy” instead of their natural multi-stemmed habit. This gives them an extra-dramatic presence in the landscape, though the additional time and work it takes a grower to create this unique form makes them more expensive than their conventional counterparts. Caring for tree-form shrubs is as easy as caring for the normal kind, though pruning needs are different. Most shrubs don’t strictly require yearly pruning, but tree-form plants do: the top will grow larger and faster than the trunk and may even obscure it, so keeping the two in scale with each other is important. Start by looking carefully at the whole plant to determine what size canopy looks right with the thickness and height of the trunk. First cut out any dead branches as close to the main stem as possible, then shorten the rest of the branches. How much you cut off depends on the age and size of your plant, so rely on your eye and judgment. As a general rule of thumb, plan to cut the canopy branches back by about half their length, though harder pruning may be required. As long as you leave a minimum of one-third of the top intact, you won’t harm the plant. When you cut your tree-form shrub is as important as how you cut it. 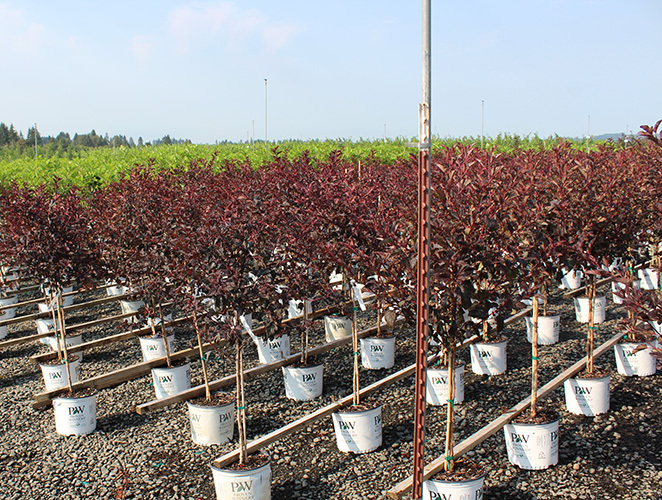 Some species should be pruned in early spring, just as the new growth is beginning to appear on the stems, while others should be pruned after they flower. If you prune your plant at the wrong time, you won’t kill it, but you will eliminate all of the flowers for that year. Never cut into the main trunk of the plant, but if any errant shoots appear along it, they should be removed right away. Aside from pruning, simply giving your plant a 2-3”/5-7.6cm layer of shredded bark mulch and keeping it well-watered (especially during hot, dry weather) is all you need to do give your tree-form plant a long and healthy life. We’ve also created a video to demonstrate the process. We planted our 4ft. PH last summer and then pruned it in the fall (although I now realize we needed to wait until spring). We pruned it to the recommendation of the seller which was about the size of a basketball. This spring it began to bloom but not at all where we pruned. It grew vigorously and produced large blooms just as your literature says. However, the stems and blooms became so large that with heavy rain they bent to the ground and many of the stems broke. What should I do to avoid this happening again next year. I wish I could up load a picture. I have had to cut the broken stems and others continue to ly on the ground. Any help is appreciated - this is truly a beautiful plant! for years we have had hydrangeas that never flowered. we bought a panicle hydrangea and want to know do we cut the dead stalks in winter in the spring or not at all. and if in the spring is that after new stems form? I live in Western Kentucky.. Would tree formed shrubs have to be taken in during winter months to avoid freezing? No, as long as the plant that you purchase is hardy in your area. 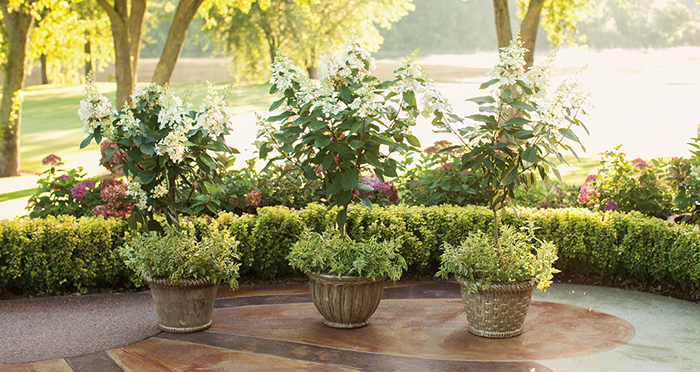 Indian hawthorn, for example, which is mentioned in this article, cannot be grown in western KY, but you would be successful with panicle hydrangeas, ninebark, rose, lillac, and rose of Sharon. Should it be pruned in the fall? Ours is very spread out and drooping down. The Black Lace is best pruned immediately after blooming. It may be pruned to the ground each year and grown like a perennial if you like.